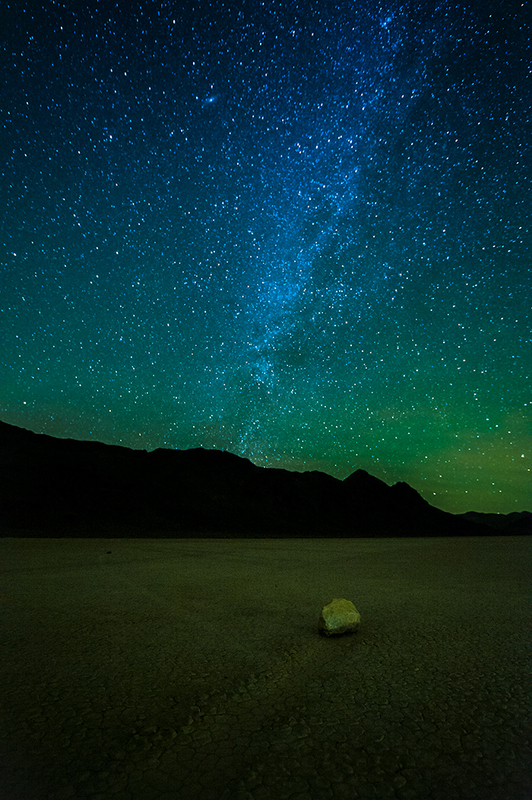 I wandered out on the playa lake around 10pm to shoot the stars and had to deal with strong winds. I could feel high speed vibrations in my tripod legs so rather than risk blurry shots I decided to head back to the car. I set the alarm for 2am and when I woke it was like the wind gods had flipped off the switch. The milky-way was visible in all it’s glory and wow what a sense of peace and awe. I had a few hours before sunrise so I walked into the scene with my flashlight and tried to make some patterns. Painting with light takes some practice, there were quite a few bad shots that made no sense but eventually I got something I liked. Be prepared for a rugged 20 mile drive to this location. With hard work the rewards are sweeter. My wife, Tracy said she likes the shot without the flash light work. She felt the sky was powerful enough to stand alone and adding the light was a distraction. So here is the one she likes. I used a quick blip of the flashlight, as fast as I could turn it on and off, to add some light to the rock. Feel free leave a comment as to which you like better. When light pollution is a minimum the milky way becomes a prominent band through the night sky. I think I agree with your wife – it’s hard to beat the “au naturel” look. The first pic is definitely cool though – it looks like some UFO about to take off from another planet. I like em’ both! Hows that for being helpful? Not… Really enjoying your images Ferrell. Your work is tremendous! I must say I’m relieved you weren’t abducted by aliens…ha. 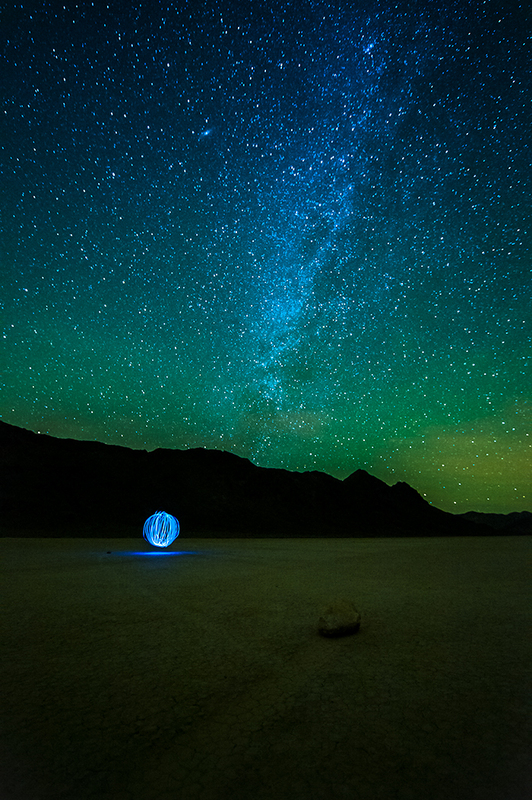 The light painting creates a surreal image, very cool. I love the alignment. I guess it’s not for everyone though. I definitely like the second one the best. It doesn’t look as artificial. Me too, the second one highlights the beauty of nature and that’s why I made the trip there.